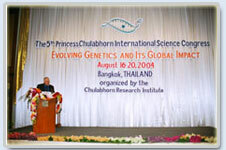 This series of international congresses was initiated to provide a forum for the exchange of the latest information and the most recent advances in research among the international scientific community. Under this program, international congresses on selected topics in science and technology are organized every 4 to 5 years. 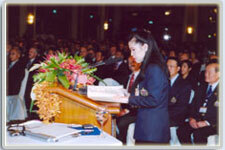 Past congresses have been attended by over 1000 participants on each occasion. 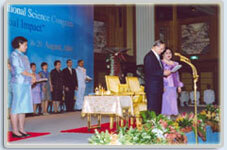 The 1st Princess Chulabhorn International Science Congress (10-13 December 1987) "International Congress on Natural Products"
The 2nd Princess Chulabhorn International Science Congress (2-6 November 1992) "Environment, Science and Technology: The Challenges of the 21st Century"
The 3rd Princess Chulabhorn International Science Congress (11-15 December 1995) "Water and Development: Water is Life"
The 4thPrincess Chulabhorn International Science Congress (28 November - 2 December 1999) "Chemicals in the 21st Century"
The 5th Princess Chulabhorn International Science Congress (16-20 August 2004) "Evolving Genetics and Its Global Impact"